This versatile game table is a great piece of Amish craftsmanship that will bring friends and family together for some friendly competition and fun nights of board games. When you're finished with your games for the night this game table can double as an end table and be put away in plain sight right next to your sofa or bed. 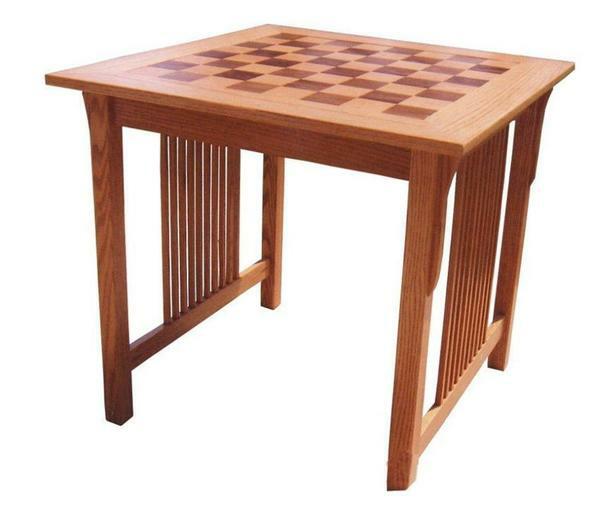 This chess or checker table is built by Amish craftsmen from 100% top-quality hardwoods right here in the United States. Choose the look of your table by using your favorite wood type as the materials used for this brilliantly crafted game table. Your choices of wood include Red Oak, Cherry, Hard Maple, Brown Maple, Quarter Sawn White Oak, Ash, or Rustic Cherry Wood. The Amish craftsmen that build these tables take pride in their work and make sure the quality and durability are enough to hold up to generations of competitive game nights! I appreciate the continuous updates which you all provided me along the way about payment, and delivery. It was worth the wait!